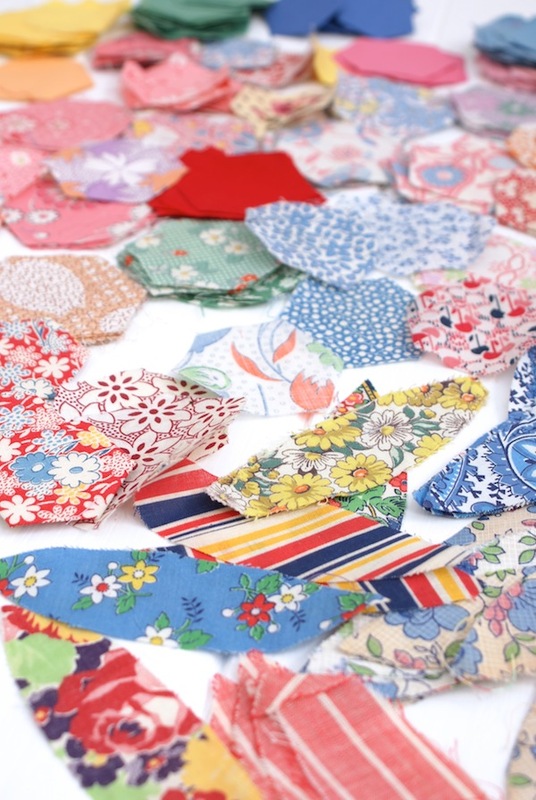 I think it's pretty clear how much I love English paper piecing - combine that with my love for vintage and antique fabrics, we're onto a winner in my book! 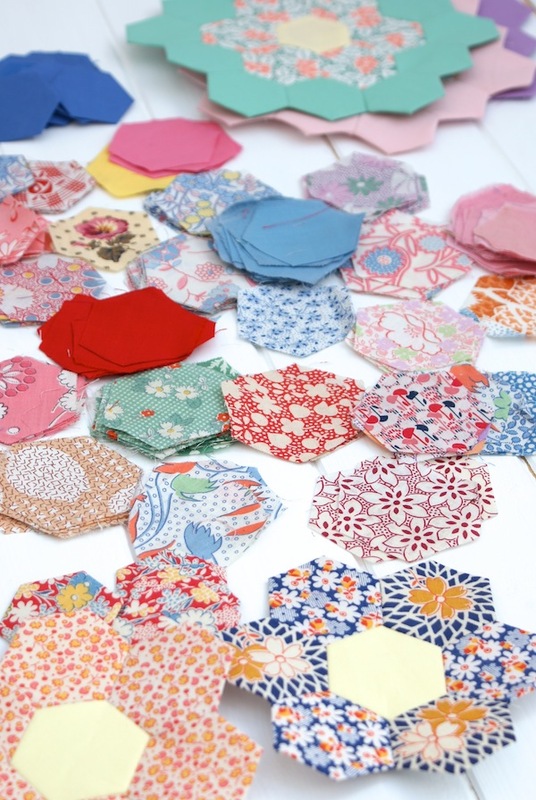 So you can probably imagine my absolute delight when my friend Sheilah from British Patchwork & Quilting magazine sent me some vintage hexagon pieces! I have to refrain from using to many ( !! ) in this blog post as it could get out of control, but let me tell you I certainly did a little yelp of excitement when I opened up the package. Inside were a whole collection of feedsack fabric hexagons! Each one as sweet as the next, with matching solid fabrics. I'm *so* lucky to have received such a lovely a thoughtful gift so I immediately put them to use and some are now sewn into new flower blocks for my GFG quilt. Yay! Below are the latest blocks I've been working on for my quilt. Can you guess below which are reproduction and which are 'real' vintage? Included as well, were a collection of pre-cut leaf shapes, which were most likely destined to be an orange peel quilt design of sorts. I LOVE this little collection of prints, such a happy and eclectic mix, just my style. I'm looking forward to piecing those together, I'd love to appliqué them and turn into a fun mini quilt or cushion. Ok, so pink and purple are repros and the others are actual vintage. Could you tell?! However much I love the 1930s reproduction fabrics, I don't think they can quite compare to the real thing, what do you think? I'm guessing they're from the 1940s, based on the colours and prints? Gosh I feel so lucky to have these, a huge thank you again to my lovely friend. Love them, the colours are brilliant as are the patterns of the fabric. 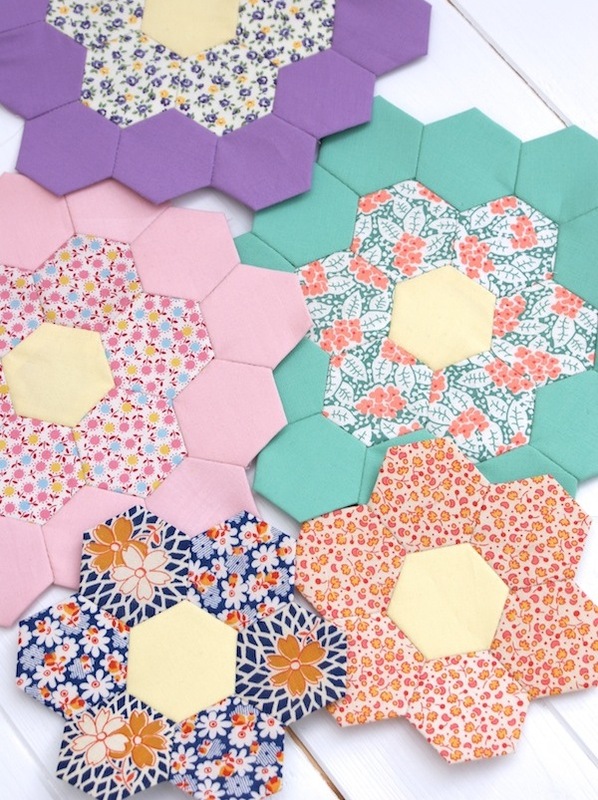 I am addicted to hexies! Just beautiful... and lucky lucky you! 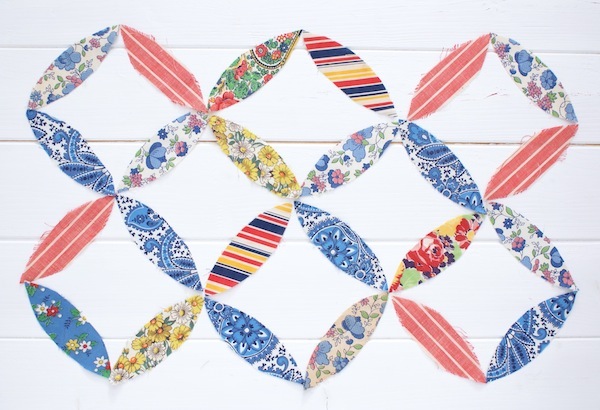 You will have lots of fun sewing these together. How lucky, enjoy your wonderful fabrics! Your hexagons look great! Stunning!! What a wonderful treat! OMG! What a wonderful gift from your friend. I can't wait to see what you do with all of those vintage flowers. Very pretty! Your friend gave them to the right person, that's certain! You are putting them to good use. How sew fun! You are so lucky to receive them from your friend!! Whenever I go thrifting that is what I look for feedsacks and or vintage fabric, I love them, I think your are right even tho I love repros and have loads of them, their is nothing like the original.. Have fun! !